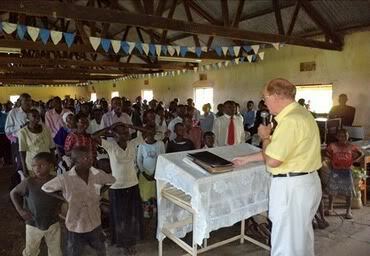 Abundant Life International Ministries (ALIM) in obedience to the Word of God (Mathew 28:19) continues to make disciples for Jesus Christ through preaching and teaching to ground the church of Christ in Uganda. This time around, the team had a miracle rally on 31st of August through 1st of September in the Eastern town of Sironko and a crusade and conference in a Uganda- Kenya Boarder town of Busia from 5th-8th September. 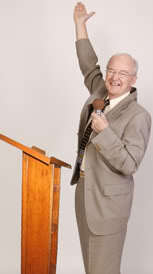 The Miracle Rally was conducted by Pastor Ernest, and Mike in conjunction with Sironko Pastors and Elders Fraternity. The crusade team composed of Pastor Mike Smith and Adrian from New Life Family Church in Suffolk, England, Pastor Richard and Gail Donaldson, Brian Kerlin, Kenneth Anderson, and Ursina Capeder from Jesus is Alive Church in Tobemore, Northern Ireland and Pastor Ernest Howie from Abundant Life Christian Fellowship in Coleraine, Northern Ireland. The team from UK together with the local team of ministers consisting of John Faith, Samuel Sombi and Pastor Apollo Massa affiliated to ALIM in Uganda joined hands with the Pastors Fellowship in Busia District to carry out this noble Cause. 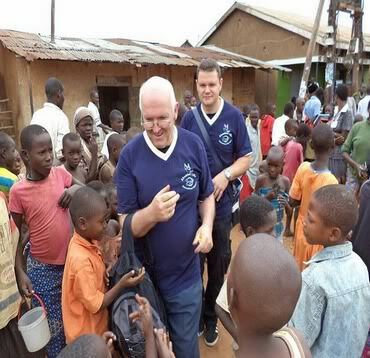 During this time of ministry, the team got involved in prison, Hospital, School and street ministry. Pastor Ernest and Mike ministered to Pastors and Church leaders and many of the 5,000 who attended the conference confessed that they have been transformed by the word and their lives shall never be the same. 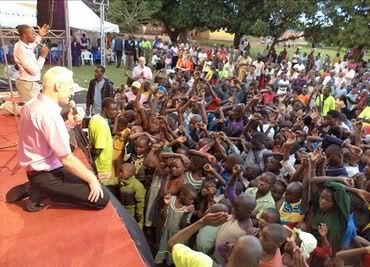 A total Number of 1020 souls were saved by accepting Jesus Christ as the personal Lord and saviour during the crusade week. This took place on the 31st of August to 1st of September 2012. The rally with over 1,000 attending was power packed with Miracles, signs and wonders. Hundreds of people who attended were encouraged, revived and healed. During the last session, many people gave testimonies of healing, both in body and soul to the glory of God. This miracle rally was the 1st of its kind for ALIM and Pastor Ernest and Mike are grateful to the Lord that he is leading them to this direction in fulfillment of the scriptures (Luke 4:18). Jesus came to set the captives free. After the rally, the Pastors invited Pastor Ernest and Mike to hold a life changing and healing crusade in 2013. .
On the eve of the crusade, the crusade team and the organizing committee had dinner with the political and civic leaders of the district. This event was intended to develop closer relations between the leaders and the church as well as bridging the gap for the gospel. In attendance were the Presidential Assistant, the Chairperson District Security Committee, the District Police Commander, the Town Clerk and the District Chairperson among others. The district leadership welcomed the ministry team and wished them success as they did the will of God, and promised to be part of the crusade in all ways possible. Because of this political and civic gesture, the team moved throughout the town and the surrounding villages in the course of the week, preaching the good news of the saving power of Jesus Christ. . The crusade took place on the evenings of 5th -8th. The Ministers at the crusade were Pastor Ernest Howie and Mike Smith. A number of activities took place during the crusade. There was a prayer tent for the sick and all those that needed counseling and prayer. With Counseling and prayer, many people were delivered from all forms of oppression while others received Jesus Christ as their personal Lord and savior. As people yielded to the gospel, many miracles of healing and deliverance came to pass and were witnessed by those present through testimonies by those healed. Street preaching was one of the most exciting strategies for making Christ known. The teams moved through the villages with a truck loaded with the sound system with occasional stopovers in trading centres and villages where they staged and preached the word. Many people made a positive response to the gospel and accepted Jesus as Lord and savior. The conference for Pastors and leaders started on 5th to 7th and was conducted in the morning hours (9.00am-1.00pm). The main purpose of the conference was to enable the pastors and leaders be aware of the awesome presence of the Lord in their midst as they go about with Ministry work. The messages taught focused on enabling the pastors and leaders to realize that God is more interested in who they are as individuals than what they do for Him. The messages were received with gladness and we believe that Busia will never be the same again. 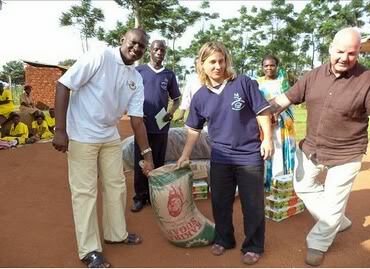 The team went for ministry to the main prison in the area. While in the prison, the team was welcomed by the Officer in Charge (OC) who introduced the team to the inmates. Pastor Richard of Jesus Alive Church together with Ursina from the same Church preached to the inmates and 35 out of 75 gave their lives to Jesus Christ. 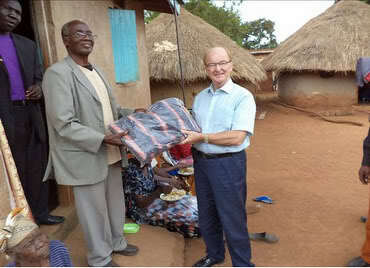 Pastor Richard presented to the inmates the gifts of blankets, soap, Sugar and Sanitary Pads for the female inmates. The OC was grateful for the gesture of love that was demonstrated by the Ministry team and commended the good relationship they enjoy with the church in the district as a development Partner which has yielded such good results. He pleaded with the church to continue including the prison in their programmes. Ten schools were visited in five days, 5 primary and 5 secondary. During the visit, the team was given an opportunity by the schools to talk to members of staff and students. The gospel was preached with passion and many students responded by giving their lives to Jesus Christ. 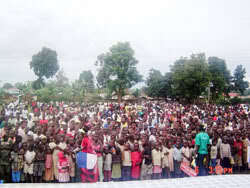 Each school received gifts of a foot ball and a net ball, pens, pencils and other scholarly materials. 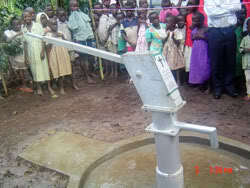 These were to be given to needy students and pupils who could not afford them. Members of the team visited Masafu hospital and Busia Health Centre 4 where they prayed with the sick, and presented to each one of them a gift of soap, sugar and Milk for babies. Pastor Ernest and the ministry team met in fellowship with all those who gave their lives to Jesus Christ during the week of ministry. Pastor Ernest welcomed them to the Kingdom and encouraged them to be strong in the Lord and not to turn back. He presented to them a gift of a t-shirt to remind them of their new fatherhood whenever they put it on. 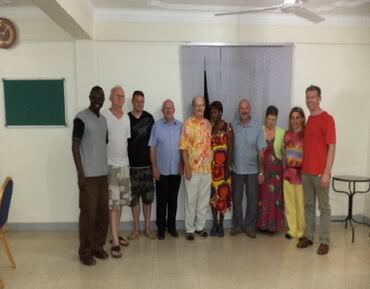 The fellowship was concluded with a meal and the new believers were handed over to the Local Pastors for nurturing. Each T-shirt carried the words "I am a child of God". It is glorious for one to know that God's purpose during these end times is to know Christ and making Him known. The ALIM team has discovered this secret and for that reason, the Lord used them to do such exploits. The team gives thanks to God for His provision and for His servants Pastor Ernest Howie for being a channel of blessings to all.